Master the art of cleaning auto glass with Diamondite and the Glass Master Pro! The Diamondite Perfect Vision Glass Master Kit includes the handiest glass cleaning tool around, the Glass Master Pro, plus Diamondite’s amazing glass cleaner, Perfect Vision. The combination leaves an incredibly clear, streak-free shine on all automotive glass! Cleaning automotive glass is one of the least enjoyable parts of my detailing routine, but it’s a necessary evil. Fortunately, the Glass Master Pro used with Diamondite Perfect Vision Glass Cleaner makes my car’s glass shine with minimal effort and absolutely no streaks. Diamondite Perfect Vision Glass Cleaner ™ uses nonionic surfactants as its primary cleaning agents. Unlike ammonia, surfactants lift and suspend contaminants without affecting the glass itself. This technology allows Perfect Vision to actually remove dirt, films, and grime from the glass instead of spreading it around. Perfect Vision Glass Cleaner leaves the glass virtually invisible. Diamondite Perfect Vision breaks up films on interior glass and completely removes them. No streaks, no smears. Smoker’s film disappears along with that yellow tint. This large waffle weave towel holds 7 times its weight in moisture and has a willowy soft texture that’s completely safe on glass. The waffle weave provides some scrubbing power to remove tough films and bugs from glass but the micro fine fibers will not scratch. The tremendous moisture capacity of this towel eliminates excess moisture and streaks. Used with Diamondite Perfect Vision Glass Cleaner, the waffle weave glass towel leaves glass perfectly clear. 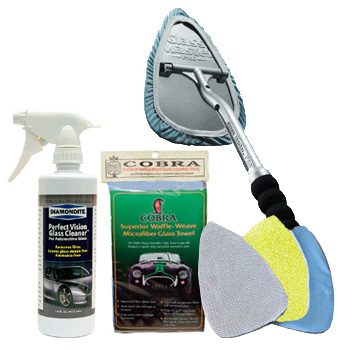 This kit really does make cleaning your car’s glass much easier and more enjoyable. In addition to auto glass, use the Glass Master Pro and Diamondite Perfect Vision to clean household windows, doors, mirrors, and glass top tables. Mist the bonnet with the glass cleaner and reach the top edge of tall mirrors and doors. The Diamondite Perfect Vision Glass Master Bundle is a great savings off the regular retail prices and, with the effort it saves, its well worth the small investment.